While this isn’t a story about the N213 night bus going through to Croydon it is about the alternative option which allows Worcester Parkers to get back from Croydon in the wee small hours with a change of bus in Sutton. 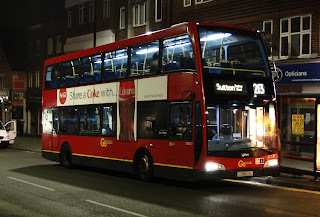 As readers may remember, Sutton and Croydon’s London assembly member Steve O'Connell has been pushing to get the N213 night bus which used to serve Croydon but now finishes in Sutton, to go through to Croydon again. However, Transport for London (TfL) said that this would require an annual subsidy of £140,000 of public funds, representing a subsidy of over £3.50 per additional passenger trip and unfortunately this cost could not be justified. As a compromise though, TfL will introduce three extra late night bus journeys on the 154 route from West Croydon Bus Station to Sutton starting from Saturday 2nd November. These will leave West Croydon Bus Station at 1am, 1:30am and 2am. There are currently no additional buses going in the opposite direction; the three extra buses will be finishing at the Sutton bus garage. The last bus heading towards Croydon (coming from Morden) will still be passing through Sutton at 1:32am. These three buses used to finish at Croydon and come back to Sutton without passengers so running the route back to Sutton again is a more efficient use of resources. The frequency of 154 buses in the evenings and on Sundays is also increasing. Buses will run every 15 minutes every evening after 8pm and on Sundays, compared with every 20 minutes currently. Buses will continue to run every 12 minutes during the day from Monday to Saturday. "After four years of lobbying TfL, I welcome the three additional late night bus services on route 154 from Croydon to Sutton. These new buses will offer residents, especially women and young people, a cheap, safe and quick method to get home from shift work or a night out in Croydon, Sutton or Kingston. I now urge TfL to go further and work with local authorities to look at ways in which they can make this a round-the-clock 24-hour service." This now means you will be able to leave Croydon at 2am to reach Sutton some time between 2:25 and 2:40 (scheduled for 2:27). Then walk to the High Street stop to catch the 213 at around 2:56am through to Worcester Park and beyond. So not perfect but a large step in the right direction. But I guess we should at least be happy that they are looking to give us, the tax payers the best value for money rather than having us pay for a service that will be underused. Its probably a good compromise.